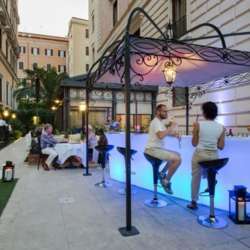 Spring is here and the evenings are getting longer, so we're happy to spend one of them together in the beautiful Rose Garden Palace Hotel on Via Veneto. With both inside and outside spaces to cover all types of weather, we will be waiting for you at 8pm. All our guests will enjoy a welcome drink of their choice, the buffet* and the chance to meet other international minds. Feel free to invite your international friends and colleagues to join us at this elegant location and if they would like to sign up to InterNations at least 48hrs before the event, they will be able to enjoy our members-only discounts. If you are coming by metro, remember to check if Barberini station has re-opened, otherwise walking from Termini is the safest bet! *Please arrive before 10pm if you'd like something to eat - we can't ask the kitchen to stay open all night just in case there are latecomers.